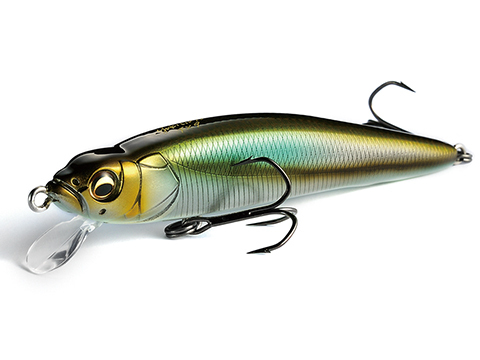 FX series is a real flat side minnow created by Japans craft sense. During casts, the FX series has its lips to flap by installing a “resistance variable flap bill PAT.P” decreasing air resistance while extending its cast distance. It materialized “long shot” overturning the common sense of slim lightweight minnows. 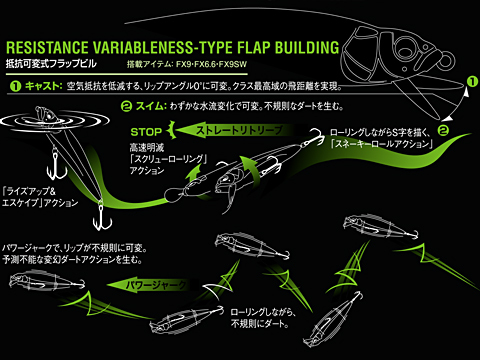 Additionally the flap bill converts by the changes of water flows while jerking, creating a transforming unpredictable action. This is exactly a panic action shown by baitfishes when encountering fish eaters feeding time. The high responding FX made by the “decentralized balancer system”, will create “screw rolling action” drawing S shape making high speed blink and flash at straight retrieves. When the retrieve stops, it floats while lifting its head, performing a “rise & escape” action. It is Megabass original flat side realistic minnow using an infinite unpredictable action, “long distance attack” + “realism”+ “one bite size” as a key factor to make the spooky bass bite in one shot.